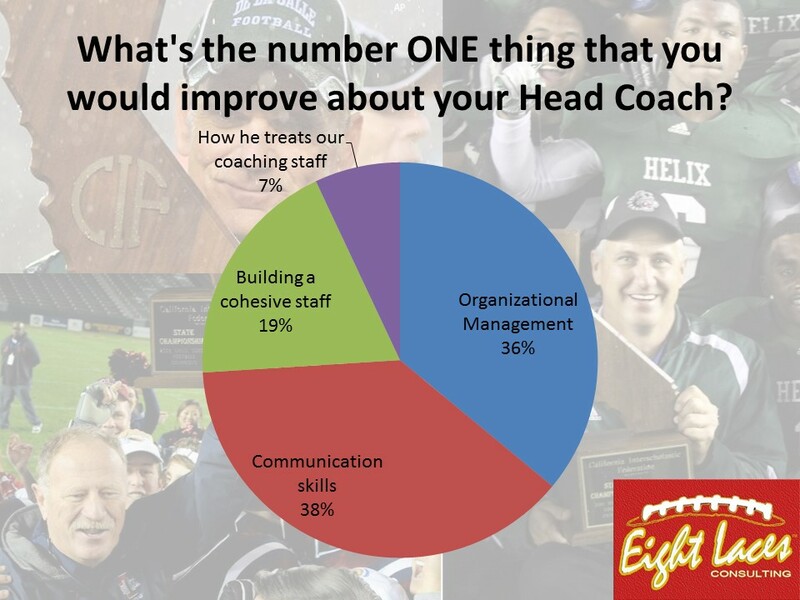 Here is what assistant coaches said is the #1 thing assistants said that they would improve about their Head Coach. Allows me to coach my group without looking over my shoulder all the time. The way he treats the kids and the coaches. You can tell he genuinely cares for those around him. Family time is important to him as well as giving kids time off in the off-season. He shows me loyalty and freedom. A good head coach creates buy in by giving his assistants a stake in the program. If they’ve created a part of it, no matter how small, then they have a much higher stake in the program’s success. Our head coach does a great job of letting everyone have input. He also gives us the freedom to use our on styles, etc. Give the coaches ownership of aspects of the program, and then hold them accountable. Have open dialogue about issues going on in the program, even if he decides to go another direction. Nothing, I am committed to the kids. Our head coach started our first meeting with a Bible verse and our team philosophy. We all felt comfortable adopting the philosophy immediately and spreading it to our players. Our HC does a very good job of being open to new thoughts, ideas, plans and allows us to implement those if necessary. A good listener to ideas, and is very good with coaches family issues that arise. Gives ownership to assistants over different aspects. Makes every coach feel a part of the staff, isn’t a micro manager, doesn’t have meeting just to have meetings, very good at planning and communication with staff. Genuinely care about me as an individual, not just what I can do for him as the head coach. Servant leadership where they don’t mind getting their hands dirty right along with everybody else. Help his staff see the big picture and allow us to help make decisions in order to achieve the desired goal. My new head coach is an “or else” kind of leader. I have only worked to help the kids, not for his benefit at all. I will not be working for him next year. That has been the biggest issue, not everyone works in the building. It’s hard for him to get that 100% buy in from all of the coaches when he doesn’t see everyone every day. Allows me to integrate myself into all aspects of the program; o, d, specials, offseason, youth camps, fund raising. Allows me the freedom to be myself. Put the kids before his ego. A head coach will value the input of all assistants and respect their time on and off the job. Treats the staff like family. We always know that we have each other’s backs. We have a family environment within the staff. The best head coaches that I have been around have meticulous organizational habits and delegate responsibilities clearly to players and staff…and then they hold everyone accountable. It is all about kids! Running a program to develop the character of our kids so that they become better students, better siblings, better sons and better husbands. Give vision and direction constantly for staff & players and stake holders. Communicate a clear plan. How, who, when, why, etc. Makes sure we work with him not for him. Bring his A game every day with high expectations for everyone involved in the program -having a vision and communicating well -Believe in you as a coach and sell you as a great addition to the program. A great head coach will communicate his plan clearly and consistently implement that plan. He/she will encourage his/her staff to be excellent at their jobs and reward that excellence. The way he treats his coaching staff and kids. Provides a clear vision for the whole program and constantly reminds the kids and the staff of that vision and what we are working for. He’s the most selfless person I know. He does all the things that you would never expect a Head Coach to do. Allows your input and implementation of your ideas in order to create buy in. Gives me the freedom to take on tough tasks that allow me to take ownership. Sticks to his word, and values kids as kids, not a product. Creates family/team environment. Sets/builds foundation of program. Our Head Coach does a great job of getting the staff to buy in. I’m not 100% sure how he does it, a lot of it is his personality. He’s incredibly loyal and always makes the assistants feel appreciated. We also do a lot of stuff as a staff, clinics, Thursday night dinner, Friday night party after the game, etc. In addition to this he is great about giving the staff autonomy and not micromanaging. The line he uses all the time is “I want to let you guys just worry about coaching” and he sticks to it. We have very little paper work and admin jobs we have to do. Our staff has a great environment and really has the family like atmosphere. Head coach deeply cares about the program. Program goals trump everything else. Laying down the philosophy and the process and living the culture he wants to implement. caring about the players more than about winning. Truly believes in the program and in the kids. Truly cares for the kids and wants them to succeed in life and in football. Listen to me and let me feel like my voice is heard. Give me freedom to take charge of projects that I want. Creating plans and schemes as a staff. Getting kids to buy in to what we are doing. At first he’s very good at telling you what you want to hear. Stays true to what he has envisioned, not back and forth. Does not rely on “That’s what we’ve always done”. Vision, follow through, passion, and communication. Makes you think about decisions you make day in and day out. His organization and plan helps buy in. A coach that seems lost is easy to spot. Express his vision to grow the program. Works a lot! Deals with the school admin which is a nightmare. Knows more than I do overall but recognizes that I’m better at some things than he is and allows me to take charge of those things. How he teaches culture instead of X’s and O’s. He gives the staff the chance to have input in the direction of the program. He tries to mentor all his coaches and give us opportunities to have more responsibility. Be consistent and include staff in decision making. Using the word “we” instead of “I” when referring to things that need to get done. He supports his staff. Helps them grow. Accepts their input. Is conscious of his blind spots and weaknesses. Take care of your assistants.